Presentations on many topics related to Educational Technology and e-Learning are available. Below is a sampling of recent keynote presentations, forum sessions, and hands-on lab sessions that I have given. The e-Learning Atheist says “You can’t teach that class online – it won’t work!” The e-Learning Zealot says “Maybe YOU can’t teach it online, but I can!” The Atheist says “You’re just trying to replace classroom faculty with computers!” The Zealot says “If you CAN be replaced by a computer, you should be!” And so on, and so on, and so on. 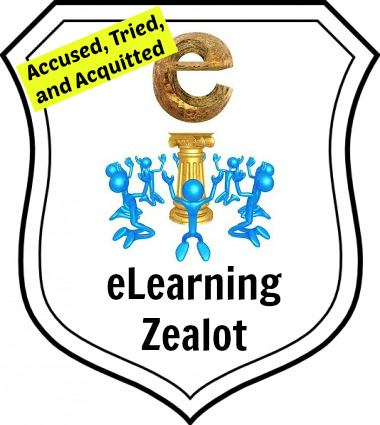 We’ll dissect some of the differing points of view from both the e-Learning Atheist and the e-Learning Zealot. To do so, we’ll take a stroll through the e-Learning alphabet; where E is for Entertainment, G is for Generations, M is for Myth, P is for Postman, and Q is for … well, for the lack of a better word, Q is for Quality. Based largely on the 1985 book “Amusing Ourselves to Death,” by Neil Postman, this is a journey looking at some of the questions related to edutainment and the current paths that higher education appears to be heading down. Network television forever changed the seriousness of public discourse related to politics, religion, and many other areas. Has the Internet and information technology had a similar affect on education? During this presentation we will consider how technology is impacting the teaching and learning experience. Are the fears of 1984 finally coming true, or are we entering a Brave New World? Some of the flavor of this presentation can be found in a couple of blog posts: Neil Postman and the iPad and Reading List from MnSCU Keynote. We’ve have been traveling down the road to e-learning for more than a decade. We can now look back and see whether some of our previous hopes and fears have come to fruition. We can also examine some of the newer thoughts about e-learning in an effort to determine just how much truth there is to some of the rhetoric. This presentation will examine many of the myths and realities surrounding e-learning. Do online faculty really work harder? Do online students really cheat more? Is it true that there aren’t any good practices for teaching developmental courses online? Is online learning really “anywhere, anyone, anytime?” Together we’ll explore some of the online learning myths and realities and make a case for the examination of some unconventional wisdom when it comes to e-learning in higher education. Format: Best delivered lecture/forum style. No computer lab needed. I typically use response cards (clickers) with this session. Time: One-hour minimum to two-hour maximum. This has been presented as a keynote address. It’s NOT my Job to Entertain Students!! Some faculty say it is not their job to entertain students. Yet, to be entertained is to be engaged. Would they also say it is not their job to engage students? Probably not. The presenters will look at ways you can engage students with technology, in the virtual and face-to-face classroom. Every idea will be something your students can do for free, and many can be used to facilitate student collaborations. One example is a creative writing project where students create an electronic comic strip rather than the same old word processing paper. The presenters will demonstrate several additional ideas using new social technologies. Participants will walk away with resources that provide access to a large number of free, Web-based tools that they can use in their teaching to engage students in new ways. Subtitle: What are the expectations, and why? Few things in the online learning world get more exposure or generate more interest than the topic of course completion/success rates. Almost weekly you can find a news article or prominent blog post that accuses online learning of being “lesser than” because of lower completion rates. Let’s examine some of these claims and look for the silver lining in these dark clouds. We’ll look at some actual data about completion rates and see whether the hype is matched by reality. After this session you should be prepared to push back a bit the next time you caught up in this discussion. Faculty who teach online typically need to make themselves available to their students via online office hours. How office hours are held for students at a distance is sometimes a matter of choice, and other times a matter of college policy. In this session, we’ll look at four different web-based tools that enable faculty to connect electronically with students in a one-to-one or a one-to-many real-time environment. All of these tools are free to use and do not require students to create accounts in order to connect. Who Are These People and What Do They Expect From Me? Generation Y has hit higher education like a ton of bricks. How is this generation different (or not) and how do they relate to faculty who come from three previous generations: the Matures, Baby Boomers, and Generation X? Do they relate to us, and do they want to? As a faculty member, what do you need to know about these people and how can you leverage their (supposed) love for technology to engage them in the learning process. Short Message Service (SMS), commonly referred to as text messaging, is the preferred means of communication for a majority of traditional-age college students, and rapidly becoming more popular with older students as well. Many educators don’t want to send and receive text messages with students, primarily due to privacy concerns or technology concerns. In this session you’ll learn how you can do it safely, easily, and for free. You’ll also learn WHY you should be doing this. Participants will get hands-on exposure to many useful web-based tools that they can use to make their work easier and their assignments more engaging for students. Audience members can try to follow along on their computers, or they can sit back and enjoy the ride. All of my presentation handouts are available on the college website where participants can get updated information at any time. There are many new web applications that are free and easy to use. Many of these services have specific applications in higher education. I will demonstrate these free applications currently being used by students, faculty, and staff. Applications related to digital photos and video, digital music tools, one-to-one and one-to-many communications, mapping, and other services are demonstrated. A presentation Wiki (or other web resource) containing all resources is shared for use after the workshop. Format: This can be either 1) Forum style (not hands-on), or 2) Hands-on in a computer lab Time: This presentation can be done in one hour. More time allows for deeper examination of the tools and/or more tools to be covered. The amount of material available in this area can effectively be used in either a half-day or full-day workshop. Format: This can be either 1) Forum style (not hands-on), or 2) Hands-on in a computer lab Time: One-hour minimum to four-hour maximum. A modified version of this presentation can be used as a keynote address. Description: Emerging technologies are being implemented in higher education at an increasing rate. There is a great deal of hope for a bright and shiny future with technology, but also a great deal of hype and maybe the occasional baloney sandwich. Will MOOCs replace our small class-sizes and cozy face-to-face classrooms? Do clickers really engage students, or is that still up to the instructor? Are lectures things that we need to capture, or things that should be allowed to escape? We’ll take a look at these and many other questions as we attempt to separate reality from myth. Format: Best delivered lecture/forum style. No computer lab needed. I typically use response cards (clickers) with this session. Time: One-hour minimum to two-hour maximum. This has been presented as a keynote address. Description: We’ll examine some of the ways free web-based tools are being used in higher education for teaching and learning, marketing, and student support. In addition to Web 2.0, other emerging technologies are also being used in new and innovative ways. What kinds of user-generated content are being created by college students and is this merely a trickle or a tsunami heading our way? Format: This presentation is best given forum style (not hands-on). This has been used as a keynote (special session, actually) presentation. Time: One-hour minimum to two-hour maximum. Format: This can be either 1) Forum style (not hands-on), or 2) Hands-on in a computer lab Time: One-hour minimum to two-hour maximum. Half-day hands-on workshop also works well with plenty of time for experimentation. Description: This session will explain the Creative Commons licensing option, which is an alternative to traditional copyright that encourages openness and sharing of intellectual property. Topics covered: 1) history of CC development, 2) overview of CC licenses, 3) who is doing it and how to find their content that you can use, 4) why we need the CC licensing options in the U.S., and 5) implications for teaching and learning. Participants will be asked to offer items for discussion of when CC licensing would be appropriate and when it might not. Additional discussion questions will be structured in a way to encourage audience participation. Format: Best delivered lecture/forum style. No computer lab needed. Time: One-hour minimum to two-hour maximum. Wikis and Blogs and Pods! Oh My! Format: Best delivered lecture/forum style. No computer lab needed. Time: One-hour minimum to two-hour maximum. Questions and answers with the audience and discussing other ways of measuring student satisfaction with online learning. why you might want to start using them. Format: This can be either 1) Forum style (not hands-on), or 2) Hands-on in a computer lab Time: One-hour minimum to two-hour maximum. how to organize the account for maximum efficiency. Description: This session will focus on 10 specific suggestions that will help improve the quality of your e-learning programs and help grow your enrollment. Participants should come away with ideas that can be implemented on their campuses to enhance their online learning courses and programs. The session will be organized as a top ten list of suggested improvements with the audience being engaged in discussion and questions centered around each item on the list. The content of this session changes each year as new ideas, opportunities, and techniques are developed and explored. Format: Best delivered lecture/forum style. No computer lab needed. Time: Approximately one-hour. Format: Best delivered lecture/forum style. No computer lab needed. Time: Approximately one-hour. Format: Best delivered lecture/forum style. No computer lab needed. Time: One-hour minimum to two-hour maximum. Optional: Our faculty leaders have developed a 1.5 day comprehensive workshop for training new faculty peer reviewers. Presentations can be customized to fit your needs. 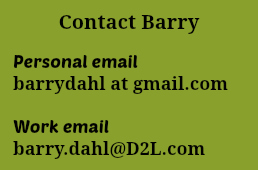 Hi Barry, met you briefly at CIT in Salt Lake. I am so impressed! I will be meeting with my other campus CTL reps to discuss possible visit from you this Spring. Do you have any info re: your daily rate; availability, etc?